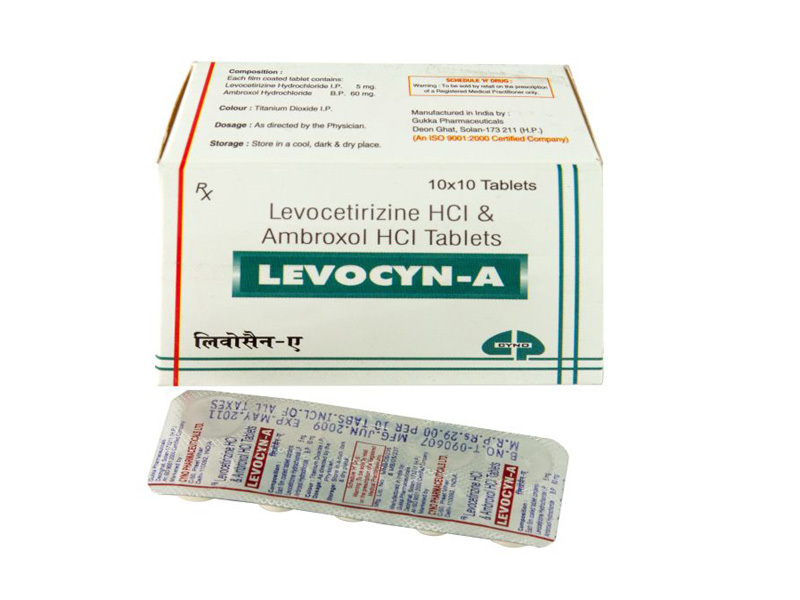 Levocyn-A (Cetirizine/Ambroxol) treats allergies by blocking histamine receptors and increasing the breakdown of mucus. It is produced by combining an antihistamine with a systemic mucolytic agent. Cetirizine is classified as second generation anti-histamine. It works by selectively inhibiting the H1 histamine receptors. By preventing histamine from acting on its receptors, this medicine helps to alleviate the symptoms caused by hay fever or other allergies (such as a runny nose and watery eyes). Ambroxol has secretolytic properties, and it works by reducing the viscosity (thickness) of mucus, allowing for more of it to be removed from the body. Levocyn-A (Cetirizine/Ambroxol) tablets are film coated and contain 5mg of cetirizine and 60mg of ambroxol. Your physician will assess the seriousness of your symptoms when deciding on the correct dosage. After this, a dosage regimen suited to your individual needs can be determined. Always follow the dosage instructions given by your physician and do not take more than the recommended dosage as this can put your health and safety at risk. Although the occurrence of serious side effects is not considered to be common, patients still need to make themselves aware of the fact that this may occur in rare cases. Attend the emergency room or consult your physician straight away if you notice abnormally hyperactive behavior, shaking, visual disturbances or any other serious side effects that have not been listed here. Contraindicated; since Cetrizine and Ambroxol are contraindicated in pregnancy; the combination generic are contraindicated in pregnancy. Contraindicated; since Cetrizine and Ambroxol are contraindicated in breast feeding; the combination generic are contraindicated in breast feeding mother.